Already feeling panicked about finding the time (and headspace) to think of and buy the perfect gift for everyone on your ever-growing Christmas list? Just to make your job even easier, this year we think you should add one more, very deserving person to your list. You! Fiona Clark, founder of Inspired Mums, is passionate about helping mums find fulfilling, family-friendly roles. She also believes that, especially at Christmas, we all need to make sure that we take good care of our own emotional needs. So this year, she’s compiled a list of some great ‘gift’ suggestions, from you to you. Every year, for most busy working mums it’s the same. You haven’t started your Christmas shopping, planned the menu or sorted out costumes for the nativity play, and already the month feels like it’s galloping towards the 25th. You’re trying to juggle everything, and panicking about all the baubles you might drop. Working mums striving to be perfect at everything often crank up the pressure on themselves in the festive season, becoming frazzled to the point where they can no longer enjoy themselves. So, this year why not take a very different approach, and make sure you look after your own needs first, before catering for everyone else? A gift from you – to you! If you’re as stuck for ideas of what to give yourself as you are the rest of your family, I’ve put together some simple suggestions to help you spoil yourself this Christmas. Reflect on the past year in a positive, encouraging way. Don’t slate yourself for all the things you didn’t get around to doing, focus on the amazing things you did achieve, big or small. If you have you started a business, joined a book club, baked some amazing cakes or managed to make it to school on time most mornings – then well done! Tell yourself it’s okay not to be perfect. So what if the house isn’t spotless, the pudding isn’t homemade and you’ve forgotten the cranberry sauce? It’s much more important that everyone, including you, enjoys your time together as a family, away from school runs, swimming lessons and work deadlines. Don’t stress about cooking large meals for family get-togethers – ask your mum-in-law to bring her signature pudding and your sister to do the starters. They’ll be delighted and if they’re not, ask them anyway. Christmas is not a competition to see who can work the hardest and show the least strain. Take short cuts, do things your own way – you have nothing to prove. You deserve a break too – force yourself to relax and enjoy the moment. It’ll be over before you know it, so make the best of it. Don’t just focus on pleasing others. Fuel your generosity of spirit by having some fun. See a friend you’ve been meaning to catch up with, see a show or buy a box set of your favourite TV series and watch it with a good supply of wine and chocolates. For 2014 give yourself the gift of a positive mindset. Start by being grateful for all the things in your life that are going well. Write a gratitude dairy or look through some old photographs of happy times and lovely people in your life to remind you of how fortunate you are. Get your nails and hair done, buy that pair of knee-high boots you’ve been hankering after, splash out on yourself without feeling the slightest bit of guilt. You don’t have to bankrupt yourself, but treat yourself to a little something you wouldn’t otherwise buy. If you’re struggling to identify your goals, are battling a lack confidence or feel stuck in a career rut, ask your partner to give you some career coaching sessions to get you on the right path for the New Year. What will you give yourself this Christmas? These are just some of my ideas. But what is on your Christmas wish list and how are you planning to treat yourself? 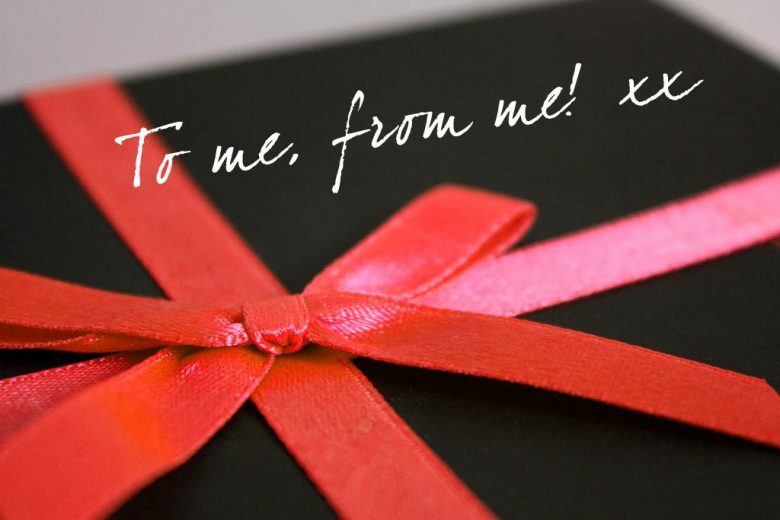 I’d love to hear how you’ll be spoiling yourself this year. How to feel confident and good about yourself. Stress-busting tips for working mums. The dangers of stress and how to avoid it. Finding the balance in your life and career. How to get your work-life balance right. You can also read how one woman was inspired to start nudge-me, a website to help other busy mums – with timely and appropriate gift suggestions for friends and family, and a handy Christmas task list.